Inform your US Representatives and Senators (1-866-961-4293), and your Governors that you know that refugees already must pass a sufficiently stringent screening process before they are admitted into our country. Please tell them that we cannot allow these families fleeing violence to suffer any longer: we must welcome them now. Please do not be silent about your support for refugees. Share these worship resources from Church World Service in your congregation. Learn about additional ways to help from Refugee and Immigration Ministries, CWS, and Global Ministries. And remember, Jesus was a refugee! We continue to pray and lift the thousands of refugees in Europe and the Middle East as the crises worsen and continue to dominate the headlines. More than 267,000 mothers, fathers, sons, and daughters have now survived treacherous voyages to European shores in what the United Nations has described as the biggest refugee crisis since World War II. For some of these thousands, their overland journeys take them into Greece, Serbia, and Hungary-countries straining to provide humanitarian support of this scale. As the world calls on European leaders to implement long-term strategies to welcome families from not only Syria, but Afghanistan, Eritrea, Iraq, and Somalia, we are called on to meet their immediate needs. Aid and advocacy are now sorely needed, and both require great coordination of efforts. In a letter issued earlier this week to the global member churches, the World Council of Churches writes, "In this critical moment, ecumenical cooperation in the response is especially important, in order to enhance the collective impact of our various activities, to encourage others and to give a common witness of compassion, justice and peace. The nature of this crisis calls for both humanitarian support and advocacy with governments." Just since last week, our partners at ACT Alliance continued to mobilize humanitarian response to the growing crisis, and Week of Compassion expanded existing efforts, channeling additional resources to member organizations in Greece, Serbia, and Hungary. Their needs are staggering. In Greece, as infrastructure is strained and registration waiting periods continue to increase, families sheltering on open beaches await a harsh cold season. Exhausted and overextended aid workers in Serbia rush to collect warm clothes, medicine, food, and diapers to accommodate the heightening influx. 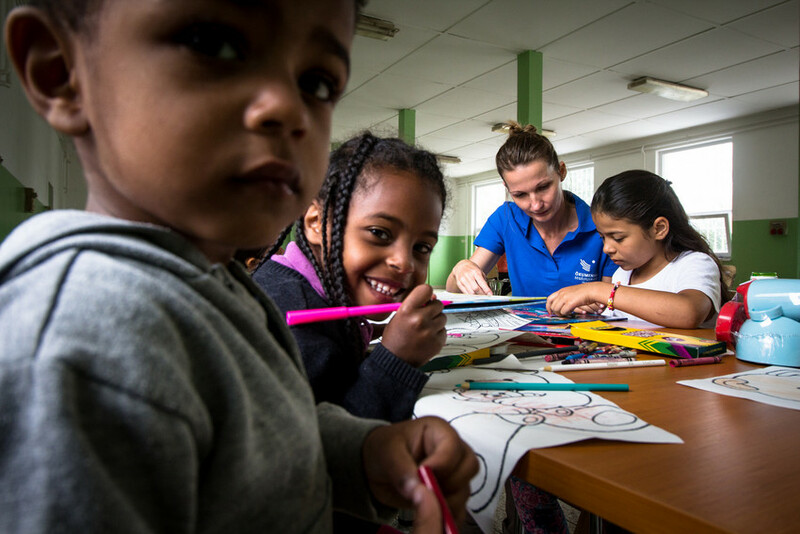 Workers in Hungary face a mounting need for hygienic supplies, psychosocial support services, and means of providing state-mandated access to education. With the lack of a legal path into many countries, all are at imminent risk from smugglers and traffickers. In the days to come, your Week of Compassion will continue to work with partners to provide food, water, warm clothing, and shelter to the thousands of displaced persons for whom the journey is only beginning. Thank you for your support and partnership, and for putting your Compassion into Action for the thousands of lives impacted by the crisis. The news has been filled this first week of September with chaotic scenes. 3-year old Alyan Kurdi, along with his brother Galip, their mother, and nine other Syrian refugees drowned during an attempt to pass the Aegean Sea in hopes of finding safety (over 2500 others have been lost in recent months attempting similar escape). Outside of the Hungarian capital of Budapest, trains packed with Syrian refugees have been halted at the order of the authorities, while the migrants inside refuse to leave because they know that they cannot survive being returned home. Since the beginning of 2015, over 100,000 displaced persons from Northern and Middle Africa, Syria, Afghanistan, and Iraq have been registered in Hungary alone, but the authorities are unable to handle all the needs of the migrants as the numbers continue to rapidly increase. All countries surrounding the crisis region are feeling the same strain on their resources, and the situation will only continue to become more dire. For the past four years, the crisis in Syria has been escalating. Unimaginable violence and unrest across the Middle East and Northern Africa has grown to a level that has created one of the greatest humanitarian crises in current memory. Not since the Second World War have we seen such high numbers of refugees and displaced persons desperately seeking safety and refuge in lands not their own. This week, we have been confronted with a visible image of exactly what is at stake: the lives – many of which have been lost – of men, and women, and small children… all of whom are beloved children of God. At this moment, the Church is being called to respond. Through Week of Compassion and its partners, the Christian Church (Disciples of Christ) in the United States and Canada have been working to provide support and refuge to those in need. Below are a few examples of work that is already underway, as well as continuing opportunities to respond to the needs of those who are living through the crisis. 100% of your gifts designated “Syria Humanitarian Crisis” will directly go to help Syrian refugees and those who are internally displaced in the Middle East and in Europe. You and your congregation can put together essential welcome kits for refugees when they arrive safely in the United States. Click here to view instructions. sstanley@dhm.disciples.org, or call 202-957-7826 to help resettle refugee families. Click here to download the latest Refugee & Immigrant Ministries alert. Click here to download the Kids2Kids Current Affairs Project on the Syrian refugee crisis.